Braised octopus cooked with garlic and bay leaves served with a delicious olive based homemade mayonnaise. Cut the bread into thin slices. Drizzle the bread with olive oil and season with salt and pepper. Bake in the oven for 6 to 8 minutes until golden brown. Crush the garlic cloves with your knife, keeping the clove whole. Finely chop the flat parsley. Bring a large sauce pan of water to the boil and then add the bay leaf and garlic cloves. Reduce the heat to a simmer and submerge the octopus in the water . Cook for about 40 minutes until the octopus flesh is tender. Drain the octopus from the water and allow it to cool before refrigerating for 15 minutes. Once the octopus is cold, cut the tentacles into 1cm thick slices. Discard the head. Squeeze the juice from half of the lemon. Separate the egg yolks from the egg whites. Whisk the egg yolks, salt, pepper and lemon juice together in a bowl. Whilst continuing to whisk add the olive oil a little at a time until you have a thick mayonnaise. Put the olives in a food processor and blitz to form a paste. Mix this olive paste into the mayonnaise. 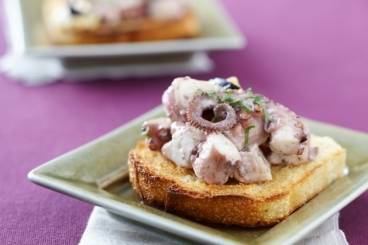 Mix the octopus with the mayonnaise and place a small amount on each piece of toast. Finish with a sprinkle of parsley and a few capers.